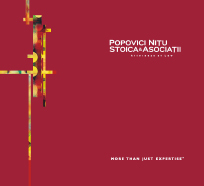 Popovici Nițu Stoica & Asociații shall always stand for continuity, superior legal work, dedication and loyalty towards its clients cause. We maintain mutual trust backed by shared values as a key element of partnership with our clients. We constantly uphold the principle of the Firm's equality to the strength of the people it groups. The Firm aspires to offer legal excellence by combining commercial awareness with knowledge and understanding.